a weekend away, holiday or for that more off-road trip. a lasting and complete weatherproof product. Opening the roof top tent is really quick and easy, thanks to the special gas strutts, which lift up the top whilst keeping the fabric properly tensioned. Fibreglass shells: textile fibre being interwoven and impregnated with liquid resinous substances which neither absorbs heat nor warms, moreover it is strong, fast and perfectly repairable. Roof Insulation: structure having a hollow space able to offer an effective thermal and acoustic insulation, and a healthier environment. Base: “sandwich” construction with 25 mm insulating material and 2steel bars. 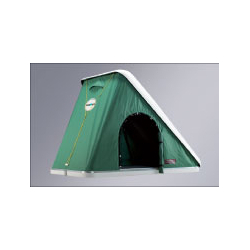 Four built-in handles in the base allow the tent to easily be handled. Fabric: AIRTEX ®. Waterproof fabric that allows a high steam transmission level. Shell closing fasteners made of steel. Adjustable closing. Mattress: made of foam rubber - density: 25 kg/m³, indeformable and with removable zip cover. Mattress cover and pillows: 100 % cotton fabric matching the relevant models. 4 universal clamps for attachment to roof bars, 2 door/windows with mosquito-netting, soundproof and anti-condensation roof insulation, 1 mattress and 2-3-4 pillows, anti-condensation Air Cap, 1 height adjustable alloy ladder, elastic straps assist in folding the fabric when closing. Standard: Columbus Large is Combi version (rear door with mosquito-netting and fixed privacy screen).